If you think you’re all Tower Defense’d out, be prepared for the tables to turn. Ayopa Games have set their sights on a time honored genre that is, to be honest, usually pretty outdated. Sleep Attack TD($2.99) is their first foray into tower defense. Our forums have been buzzing about this game for good reason. With the bright asthetic Ayopa is known for and some very unique gameplay, Sleep Attack brings some much needed defibrillation to a category of games that seems to be in constant danger of completely flat lining. 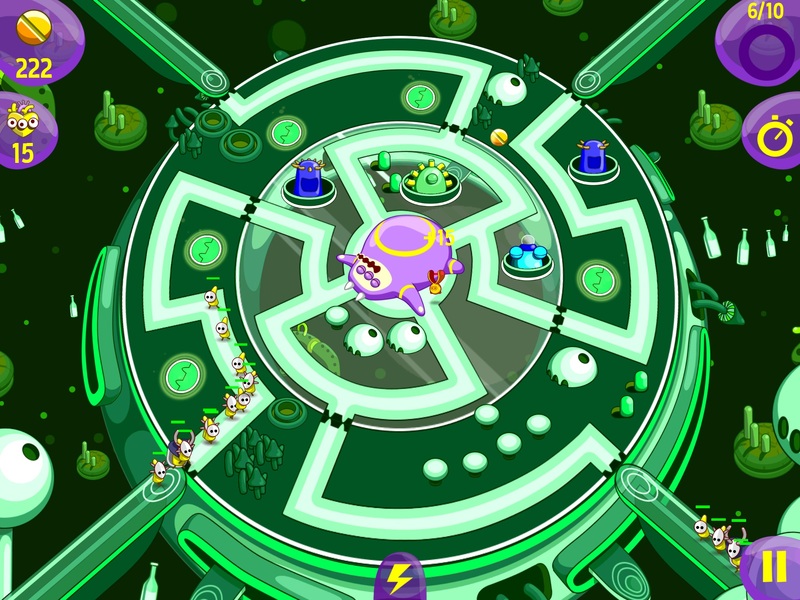 Sleep Attack is a traditional tower defense game with a big spin. Actually two big spins. Most maps in the game are basically one large turn table with a slightly smaller turn table on top of it. You build towers on the tables, and then rotate each one to preset quarter turn positions independently throughout the game. Gameplay is paused while you are rotating a table. There is no limit to how many times you can rotate or how long you have to rotate. Towers are only buildable in set locations, but as a game progresses, more and more spots will open up. I really appreciate the pause you get by rotating the board. It allows for planning even in the middle of a wave of enemies. It’s no secret I have a lot of appreciation for opportunities to make tactical choices. 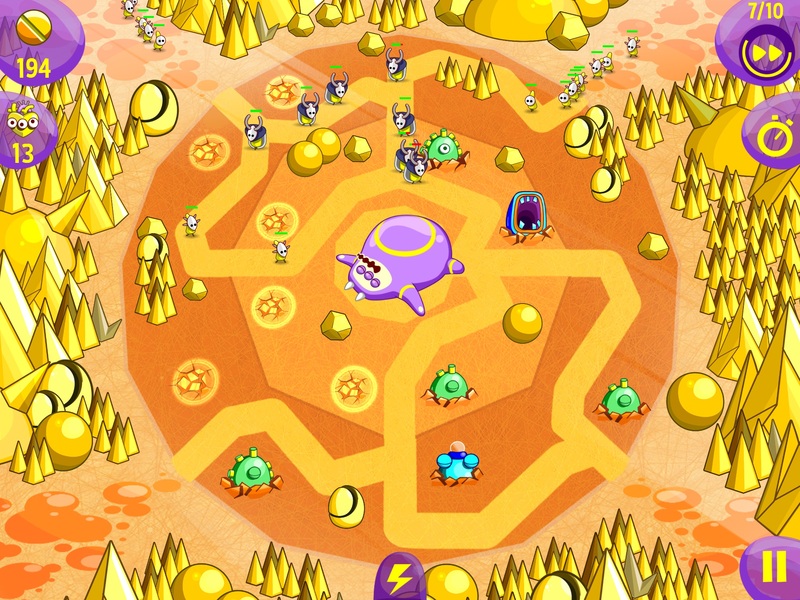 Even in a genre as strategic as tower defense, Sleep Attack has improved on the time-tested formula. The premise of the story line is that you are defending a big monster that loves to eat junk food and play video games and managed to pass out by doing it for entirely too long. And monsters want to attack this sleeping monster… for reasons. Lets not think too hard on the story, having what basically amounts to a large snorlax sawin’ logs in the middle of the map is fun and silly. The comic style of graphics also supports the goofy story line. Bright colors and maps chock full of character lend a cheery energy to the game’s landscape. So the turn table feature is the primary mechanic that distinguishes Sleep Attack TD from other tower defense games. As far as gimmicks go, this one is good. Being able to turn towards oncoming monster waves is only the tip of the strategy iceberg. If you build on more than one table, you can focus fire a single path, or divide your towers to cover multiple routes. You can even combine or divide up monster waves. This is where you can really get the most out of the towers you build. After a few games, if you can get the hang of it, you’ll be able to mow down more monsters with less firepower. The app functions pretty well. My one annoyance with performance is that battery life seems to be eaten up pretty fast on my iPad 3. Controls are fluid and pretty precise. Every once in a while when you try to spin a table, it wigs out and spins more than you might expect. Because the game is essentially paused when you rotate, this isn’t a very big deal. The game clocks in at about 860 mb installed so its not small, but not nearly as big as some of the bigger apps that are out there. The UI is a little minimal but serviceable. The difficulty in the game might seem a bit overwhelming at first, but if you spend more time with the game you’ll make some realizations. You are basically not only responsible for tower construction, but you are also responsible for directing the flow of enemies. There have been times that I have reset a level a few times after losing a health or two and just made better table turn decisions to much better effect. Once you can master turning, the game is a lot more manageable. If by some weird quirk of fate you haven’t played a tower defense game, Sleep Attack TD is a fantastic introduction. It’s also original enough to entertain even the most seasoned TD veteran. In fact, with it’s light hearted graphic style, I would only suggest avoiding it if you are thoroughly sick of tower defense games.